Despite headlines screaming about the highest vacancy rates this city has seen in decades, the cranes keep turning and the bulldozers keep moving dirt. We asked developers and the City what keeps buildings going up during a downturn. During the summer of 2014 a barrel of Western Canada Select oil cost $86.56 US. By January of 2016 it was down to $17.88 US. The drop, sudden and brutal, knocked the wind out of the whole city. By the fall of 2016 Calgary’s unemployment rate had climbed to 10.2 per cent, the highest of any city in Canada at the time, and 6,527 more people moved away from the city than moved in that year. Layoffs and shutdowns hollowed out more than 10 million square feet of office space in the downtown core, lifting the commercial vacancy rate from around eight per cent in 2014 to 25 per cent in 2017. The city’s apartment vacancy rate climbed to seven per cent last fall, the highest in 25 years. Yet, through this whole time, office space has been under construction downtown, new communities continue to lace the city’s edges and multi-family condos are multiplying on Calgary’s streets like white-tailed jackrabbits. Why, if we’re in a recession, do we keep building new places to live and work? One explanation is that development is a big-picture game. A three-year decline, no matter how steep, is just a pothole in a very long road. Much of the digger, cement-mixer and crane action we’re seeing around Calgary today got rolling years ago, long before the price of oil began to fall. Guy Huntingford, CEO of BILD Calgary Region, a group that advocates on behalf of builders and developers, says most people don’t understand how long the development process is, particularly when it comes to new communities, or what the industry calls greenfield development. “If you’re in the middle of that cycle you can’t just turn it off,” Huntingford says. The process of securing financing, planning and getting approvals can take six years or more. A project like Telus Sky, a 60-storey mixed-use tower expected to open downtown by 2018, would have been securing leases four year ago. Why does the factory take so long to produce the widget? Well, it’s a complicated widget. You can’t build any sort of structure without thinking about how it will interact with the land it sits on. You definitely can’t plan a new community of 11,000 homes without wading into the details of land-use bylaws, zoning regulations and infrastructure requirements. Allan Klassen, senior vice-president of homes at Brookfield Residential and past chair of BILD Calgary Region, says developers can’t just plan communities however they want, nor can they change plans instantly when market conditions shift. “The reality is that development and planning is very heavily policy-driven,” he says. The relationship between the building and development industry and City Hall is therefore deeply – and necessarily – collaborative. And that collaboration takes time. 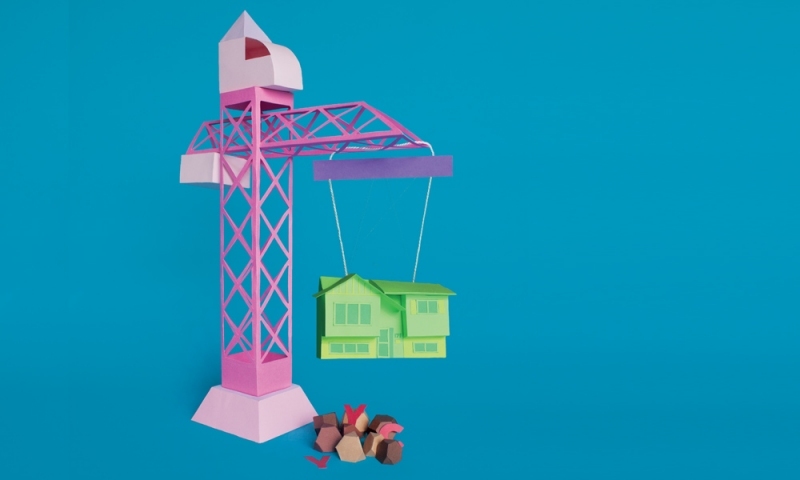 Stuart Dalgleish, general manager of planning and development for the City of Calgary, says the public and private sides of the building sector have more in common than people might appreciate. If you put the vision statements for the City and for BILD Calgary Region side by side, they’re practically identical – both are concerned with making good places to live. For builders and developers, this means aligning projects with the goals of the Municipal Development Plan, a 182-page document (with many supplementary documents) that provides a framework for the next 60 years of growth and development in Calgary. It also means working with the City on an ongoing basis to keep projects on track. For the City, it means finding ways to support and accelerate such projects, as well as development-friendly City-built infrastructure projects such as interchanges, road improvements, parks and utility infrastructure. In August 2016, as a response to the downturn, the City of Calgary came up with the Capital Infrastructure Investment Strategy, which allows “shovel-ready” public projects – those projects ready to launch as soon as they secure public funding – to move ahead without waiting out the usual funding approval process. As of March 2017, the strategy had helped push 21 projects forward, including an interchange at Glenmore Trail and 68 Street S.E. that will open land supply for industrial development. Without the strategy, these projects could have been in limbo for up to four years. If it seems odd that City Hall would respond to a downturn by accelerating major development projects, keep in mind that Calgary’s economy depends on construction. According to Dalgleish, construction accounts for about 10 per cent of the total number of Calgary economic region jobs, and province-wide, construction employs almost twice as many people as the energy sector. Putting construction projects on hold during periods of economic strife would make a bad situation worse. Another factor driving building and development right now is that an economic downturn makes money cheap to get. Todd Hirsch, chief economist for ATB Financial, says the current lowered borrowing rates make this a great time to secure money for residential investment or financing. Labour is slightly more affordable and available during the downturn, too, says Robert Duteau, senior vice president for Grosvenor Americas, an international real estate development company that recently completed two new condo towers in the Beltline (Smith and Drake) and is in the construction phase for a two-tower condo development in the west end of downtown. Land is also more affordable during a downturn. Lamb Development Corp. is currently at work on two major developments in the city (6th & Tenth and The Orchard) and is in the process of acquiring land for two more projects in Mission and Victoria Park. President and CEO Brad Lamb says a downturn is an excellent time for a developer to invest in land, or for an individual to invest in a home. “The best time to buy is when people don’t want to buy,” he says. So development continues for several reasons, but it’s not business as usual – the downturn has taken its toll. According to Canada Mortgage and Housing Corporation, single-detached housing starts in Calgary declined by about 36 per cent in 2015 and another 16 per cent in 2016. Dalgleish says the City of Calgary saw a decline both in building permit applications and in the value of those applications in 2016, and the 2016 Calgary Census report shows that 3,490 fewer dwellings were under construction in 2016 than in 2015. Davidson of Cardel Homes says the home-building sector (the side of the industry that designs and creates buildings) works on a shorter time line than the development sector (which designs and creates neighbourhoods) – six to nine months rather than six-plus years. He says the building sector has seen a 30- to 40-per-cent decline during this downturn. “We’ve definitely built a lot less houses than we did pre-downturn,” Davidson says, noting that staff reductions have happened industry-wide, as have “price corrections” – a euphemism for lower overall house prices. Indeed, the Calgary Real Estate Board reported lower year-over-year benchmark prices on every type of housing product in every corner of the city in 2016. Even so, downturn or no downturn, people are buying homes. “There are communities that are selling like hotcakes still,” says Huntingford. Northeast communities like Genstar’s Savanna and Brookfield’s Livingston are selling well, possibly because of pent-up demand for product in that quadrant. Builders who have managed to perform well in a solid market niche are thriving, too. Rockwood Custom Homes, which focuses on high-end, bespoke products like the Residences of King Edward in South Calgary and high-end single-family boutique homes, increased its growth by 100 per cent in the last year and a half. Company president Allison Grafton says the middle of the housing market has been hit hard by the downturn, but those same conditions have brought better-qualified clients to the luxury market. “The upper end of the sector is educated and knowledgeable about what they want and what they’ll pay for. Most people that come to us, they move ahead.” Grafton says. Lamb says no matter the economic circumstances, there’s always a market for property. “People need and want to own a home. You can stop them only for so long,” he says. When Lamb Development held an April 2017 sales event for The Orchard, a pair of 31-storey condo towers in Victoria Park, it sold 20 units in three hours. Far from being concerned about the future of Calgary’s housing market, Lamb is convinced we’ll see a land value boom by 2019, and that the economy will thrive again – and soon. “Right now I’d qualify the Alberta market, if 10 out of 10 is insanity, right now we’re a five. By the end of this year we’ll be a seven. And by the end of 2018 we’ll be a 10,” he says. Hirsch says what we’re seeing is a severe price correction, but not an unusual one. Nor is it, from a purely dispassionate economic standpoint, a wholly undesirable one. In 2014 the market was overheated and wages were artificially high. Industries other than the oil and gas sector found it hard to do business here. The downturn will hopefully help to diversify the economy and attract talent to the province. “It is a recalibrating of wages, employment and expectations in this city and this province that are, in fact, going to put this city and this province in a healthier economic space,” Hirsch says. Another upside of the downturn is that it forces developers and builders to get creative about affordability – it’s a great time to come up with new ideas for housing product. The process, which involves proposals, approvals and zoning changes, takes time, but Davidson says some affordability-driven innovations are currently making their way through the industry – a “29-foot, zero-lot-line” product, for example, which takes a standard 32-foot-wide lot, narrows it and pushes the property to the edges. “Any downturn forces you to re-evaluate your product offerings,” says Davidson. Ryan Boyd, senior vice-president of communities for Brookfield Residential, says a downturn offers an opportunity to reconsider factors that have been static for the last generation, such as lot depth and site coverage (the percentage of a lot that has a house on it). Currently, Calgary’s maximum site-coverage allowance is 70 per cent, but Boyd says some U.S. communities have houses that cover up to 95 per cent of their lots. Increasing coverage could allow for new products not currently on the market. It also promotes densification, one of the goals of Calgary’s Municipal Development Plan. The downturn is also having an effect on the funding model for multi-family projects. Duteau of Grosvenor says most developers are required to pre-sell 40 per cent of a condo project’s units to secure financing. Now, some developers are opting to create apartment buildings instead, which allows for different funding models. Several new apartment projects entered the market in 2016, including Torode Realty‘s 54-unit building in Inglewood, Maple Projects’ 1215 tower in the Beltline and One Properties’ Versus, also in the Beltline. Duteau says that despite being spawned by market uncertainty, these new units are meeting a real market need. “Calgary has had hardly any rental apartment buildings built for over 30 years,” he says. Taking an optimistic approach to riding out a slump is great in theory, if you’re sure the market will right itself. Fortunately, that expectation is proving reasonable as the worst of the downturn appears to be over. The CMHC has forecast stronger housing markets in 2018. Housing starts were up in the first quarter of 2017, driven by the improvement in the economy and the stabilization of oil prices at around $50 USD. Employment rates are also slowly climbing. The City of Calgary anticipates positive net migration of 1,600 in 2017, a modest number compared to the decade-long annual average of more than 14,000 people, but still, these small shifts can drive housing demand and improve market confidence. In addition to those mentioned in the story, here are some other buildings of note rising in the city. The $40 million Alt Hotel by Groupe Germain is projected to open in 2018 in the East Village. The 11-storey building will feature 155 rooms and 5,000 square feet of meeting space. At 247 metres, the 56-storey east tower of this downtown office complex will be the tallest building in Western Canada. The tower is set to be completed this year and will have Cenovus Energy as a primary tenant. Vancouver-based Concord Pacific’s luxury condo project in West Eau Claire has private garages, a water garden and a seasonal skating rink. This 28-storey tower will be the first new residential rental development in the revitalized East Village with 123 two-bedroom and 32 three-bedroom units and child care on the main level. This seven-storey, 201-unit condo development welcomes its first residents this fall. Amenities include a rooftop terrace with urban garden and private yoga and training studios. Set to open in early 2018, this complex on the city’s northwest edge will have an eight-lane competition swimming pool, multi-purpose ice rink, 300-seat theatre, skateboard park and the city’s first self-service branch of the Calgary Public Library.